performance machines: four models for larger width vineyards (1.8m upwards), a model for the intermediate vineyard (1.4m upwards) and an extra-large frame model for wide canopies and for the harvesting of olives. * The best quality harvest, with best-in-class cleaning systems. * ManagThe cab offers a more spacious, quieter environment and meets the most stringent safety standards. It incorporates an inclinometer, automatic lateral and height adjustment, and the new Intelliview ™ III monitor with touch screen. ement System’. Providing a fuel reduction of more than 35% when compared to previous Braud models. 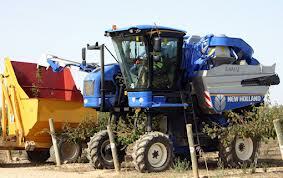 Since first introduced in 1975, BRAUD Grape harvesters have delivered the best harvesting quality and productivity. Today the new BRAUD 9000L series continues to be built around proven BRAUD design DNA. 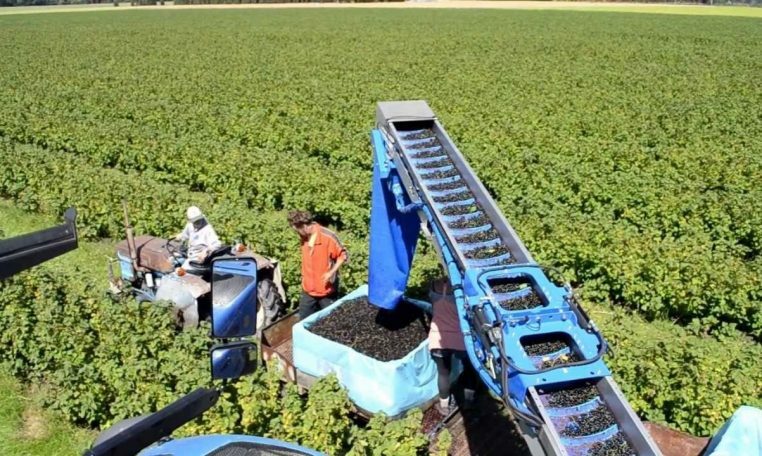 The SDC shaking system with flexible rear rod fixation and quick front engagement to softly shake and detach the grapes. The NORIA basket system revolutionized the mechanization of grape harvesting and continues to offer the best respect for the vine and harvest. Refined and developed, these proven BRAUD systems are now matched to a larger conveyor system, high performance cleaning fans and the best destemmer system. The result is improved cleaning and performance. BRAUD – the revolution continues.